The trials and tribulations encountered by Rangers in recent years has ensured that the role of our loyal support extends beyond simply turning up on a match-day and supporting the team we all adore. Our fans are the one constant in the proud history of our great institution and our backing last summer was crucial in ensuring our survival despite being banished to the lower leagues. We must again step up to the plate. The Murray years perhaps dulled our senses and instilled an unfortunate apathy and acceptance within our fan-base. It was taken for granted that a club like ours could not encounter the type of financial meltdowns that occurred elsewhere and, with hindsight, we perhaps simply assumed that Murray would sort things out himself. 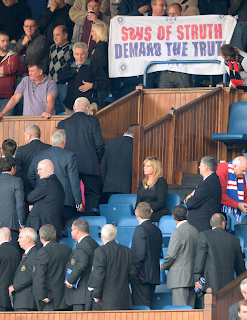 On 14th February 2012 however everything changed; the unthinkable notion that Rangers could disappear was staring us square in the face. A sleeping giant seemed to awaken that day as our supporters put aside petty differences and fought for a common goal, standing shoulder to shoulder in an attempt to keep our Club alive. If that dark cloud indeed carried a silver lining then this was certainly it. 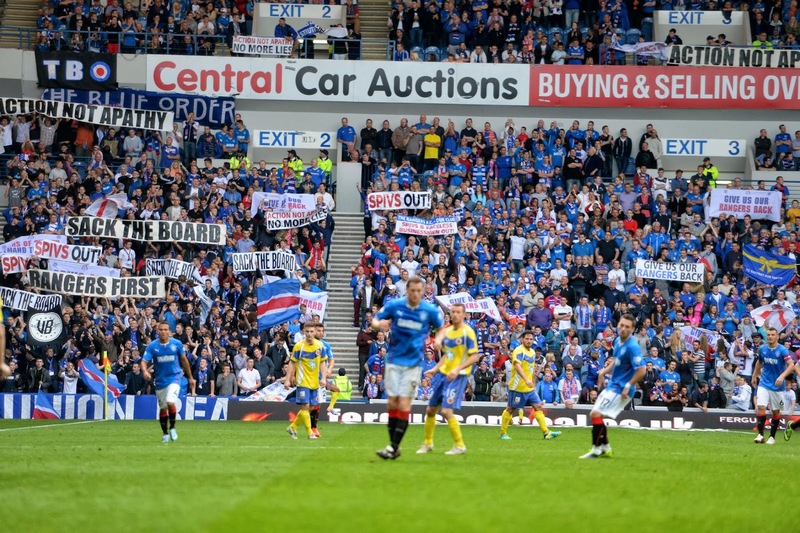 The Rangers fans rallied and continued their tremendous support despite our newly designated fourth-tier status, sending record numbers of fans to Ibrox over and over. It was utterly remarkable and attracted attention and praise from around the globe as journalists flocked to cover the story of our fall and imminent rise. Our responsibilities however extend beyond that. This is our Club and we must act as its custodians, standing firm as those who truly have Rangers’ best interests at heart. The despicable and shameless actions of Craig Whyte were an eye-opener for many who naively supported him or at least refused to believe that anything untoward was occurring under his watch. I know — I was one of them. At every turn I foolishly sought some reason, whether logical or otherwise, to justify what was going on. Look how that turned out. Nobody charged with running Rangers should again operate unchallenged or unquestioned. Our support should forever carry a healthy skepticism and remain vigilant in defence of our proud institution. It is only right that we ask questions of our board and seek clarity on the financial security and future of our Club. And there’s certainly no time like the present. We were promised transparency and prudence. There would be no excesses at Rangers we were told. Such talk has proved to be nothing more than propaganda as information is gradually being pieced together to form a worrying picture. It is time to find our voice again. Last season our Club’s turnover would have been in the region of £20 million with a further £22 million coming in via the IPO in December. To have burned through that total in around a year in the fourth-tier is very alarming and we’re still awaiting the accounts, now overdue by the board’s timescale, to tell us just where it has gone. The journey through the lower leagues was always going to be financially challenging and so there had to be a prudent approach to spending and an emphasis on living within our means. So far we’ve seen quite the opposite. To be posting significant losses and have executive directors award themselves 100 percent bonuses on top of already lucrative salaries is quite frankly disgraceful. Maybe they’ve been taking tips from the bankers. A concerned group of fans, the ‘Sons of Struth’, have recently been gathering support at meetings, meetings termed by our board as “inciting fans to unruly behaviour.” On Saturday they arranged a protest against the current board. The online community has regularly thrown up vocal concerns from many outlets for quite a while now but it is not always easy use that as a gauge of the wider Rangers support. Today the people spoke. Those were the cries. It was a surprisingly vocal display against a dysfunctional group of directors and it would appear concerns are not simply consigned to the vociferous online debates many of you will see on a daily basis. This may just have been the turning point. If these concerns are misplaced and if the board are performing well then I’m sure they will be capable of supplying evidence to inform fans and investors of this. If our worries are unfounded then I urge the board to provide the transparency that they originally promised us. Produce the accounts, explain our current situation and provide us with your plans to fund the Club going forward. That shouldn’t be too much to ask. The waters have been muddied, perhaps deliberately, with the official challenge to the board fronted by Jim McColl and Paul Murray. The current board, with the help of Jack Irvine, have conveniently shifted the focus onto individuals rather the problems that currently exist. Furthermore there is often an assumption that criticism of the current regime is support for the other side of the divide. Again, this is most unhelpful and often inaccurate. So let’s forget the so-called “MiniCo” and their perceived failings and concentrate on the matters at hand. We must continue to question the current board whether you support them or not. It is our duty to ask questions and to put our Club before any regime or group of directors. This isn’t about picking sides. This is about supporting Rangers, in every sense of the word. I would much rather ask difficult questions and be shown that there is nothing to worry about than sit on our hands and allow our institution to be exploited and pillaged by its supposed custodians. It is therefore imperative that we remain vigilant and seek the answers that we deserve. Together we have a very powerful voice. Let’s use it.